Not being an every day coffee drinker, I tend to think Turkish coffee is already superior to the average cup of morning joe. But put through this process, it transcends the bounds of ordinary beverages, and becomes something near ethereal. Each of the different flavors is discernible, from the earthiness of the woodchips to the sweet subtlety of the vanilla bean. 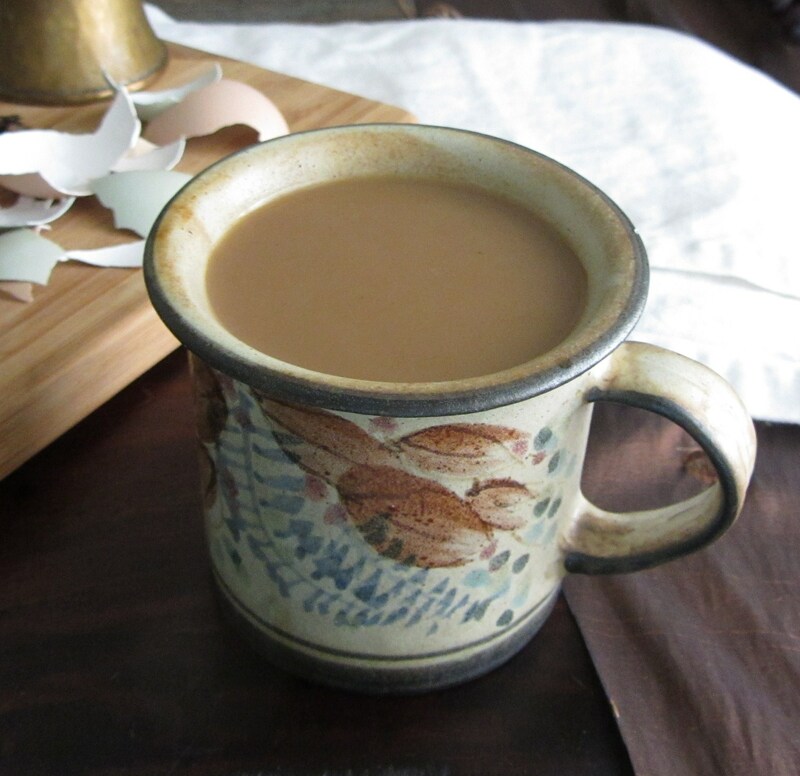 The cream thickens the already dense coffee into a silky, decadent drink. Fun Fact? The eggshells help decrease the bitterness of the coffee. See? Right there, you and I both learned something culinary and fascinating from fictional food. That’s why it’s so cool! Don’t be intimidated by the list of below ingredients and equipment. Once you get the hang of it, it’s quite straightforward. I’ve also included a version that is french-press friendly, because more people have those than have cezves. Alright. So. In a small pot, or cezve, combine the water and coffee grounds. If also adding spices, do so at this point. Place over medium-high heat and watch carefully. Heat until it froths up, then remove from heat. In a mesh bag, combine the eggshells, woodchips, and chopped vanilla bean. Suspend this bag in the mason jar, and pour the coffee over it. Allow to steep for five minutes. Remove the mesh bag, and pour the Klava through a funnel lined with cloth. Klava is best served in a mug, as opposed to a glass, so it doesn’t get cold. Turkish coffee cups are also ideal serving vessels, albeit on the small side. Makes about 2 mugs, takes about 5 minutes. I doubled the above quantities for the coffee grounds and the water, then let all the ingredients steep together in the pot before pressing down the filter. It’s a great recipe cheat for those who don’t have the cezve for making proper Turkish coffee, but are looking for a quirkier style of caffeine. How do you define eggshells being “clean?” Rinsed, washed with soap, rinsed in a mild vinegar solution to kill salmonella? Good to know. Salmonella is an over-stated risk IMHO but I’ve never had anyone explain to me why egg shells in coffee work – for all I knew it depended on the small amount of egg white still on the shells. I guess if you’re planning ahead you can either buy pasteurized eggs exclusively or wash and disinfect your eggs before you crack and use them; salmonella is almost always from the outside of an egg, not the inside. You can also save the shells from hard-boiled eggs. Works like a charm. Perfect recipe..really deserved on being freshly pressed..
your recipe needs a lot of work, but why not to try new thing. It might be better than the way we used to do. My way with Turkish coffee is adding cardamom and drink it thick in small cups. Thank u for your recipe. Thanks for the recipe and how-to! I think I’ve seen another version of this based on Brust’s Jhereg books, but it was a bit vague. This is much better! Looking forward to trying it. Turkish coffee is hard to find, but I’m going to give this recipe a go with regular Espresso. It sounds so good. This looks delicious! Great Post! Wonderful! I love coffee and a new way to drink and make it is exciting. Where do you think I can get Turkish Coffee? I am in TX so it may be difficult to find here. eggshell in coffee ? I’ve never heard & think about that …haha..too awesome! To Naswaent in Malaysia: perhaps you can replace wood chips with coconut husk? Interesting technique. I like the still-life photos, too. must try this one day… I wonder if the eggshells alkalize the coffee as well (which would account for a decline in bitterness) must make this and pH test it sometime. Ooh, science! Let me know the results, if you do! I’m not much of a coffee drinker either but I love the smell of it, and this recipe sounds incredible! Thank you for sharing it. I can’t wait to try it. Oh, I know, the smell is killer. :P Thanks for stopping by! While I have no qualms about eating raw egg, for some reason eggshells seem dirty to me. I wonder why that is? Great use of eggshell though. I guess I’ll just have to wash those shells and get over it. As another non-coffee drinker, I can heartily recommend it. :) And it turns out that pulling food from fiction, and making it real, is a wonderful and delicious adventure! Wow! Egg shell for lessening the bitterness? Never heard if it. TFS! I’m not much of a coffee drinker, but when I do (usually after a big dinner, and too much red wine) I want it to be really good. This might have to go on the list. Congrats on being Fresh Pressed to boot! Hmmm, that’s different, but I’m sure it’s enjoyable. I’m too lazy for all that. Just as happy to open a jar and take out a spoonful of coffee granules and go from there. I guess anyone doing it this way should be prepared to eat a lot of omelets. Looks and sounds delicious, but… wood chips? Where would one get that? I don’t assume you’re talking about the ones people use for gardening? Haha, no, not the gardening type. :) You can find perfect woodchips at home brewing stores, or sometimes even at grocery stores. They are sometimes used for smoking or grilling meats. Good luck! Nice recipe with beautiful photos! Yum! Oh wow! Speaking as a HUGE fan of coffee, I am dying to try this out! 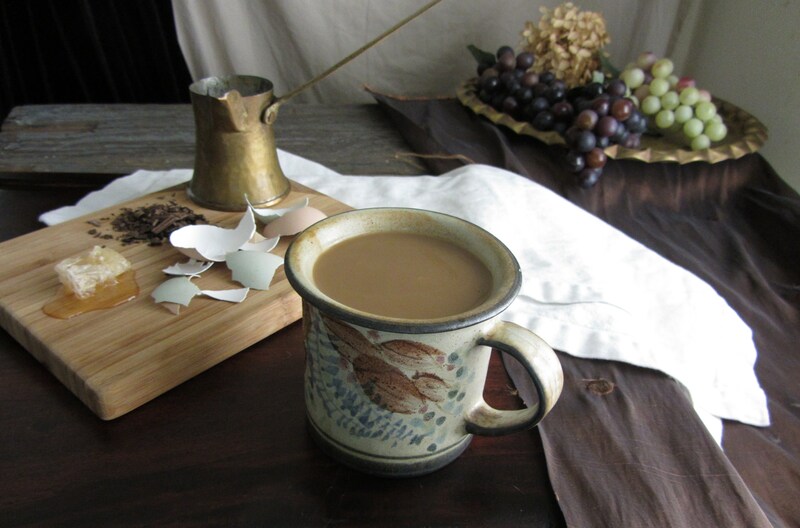 Could you put the brewed Turkish coffee with the eggshells and wood chips in a french press to steep instead of over a mason jar in mesh cloth? It would be easier for me considering that I have a sizeable french press. Definitely doable! You may have to tweak the proportions a bit, but I’m sure it will work. Sweet! Just the reply I wanted to hear! Do you think I should allow for a longer steep time? Even with the regular recipe, you’ll have to test until you get the taste right where you want it. Start with the same steeping time, and go on from there. Good luck! Thanks for the post. Klava sounds interesting and the recipe. We could zap the eggshells in the microwave to sterilize them, unless doing that hurts their absorption ability as a filter. Very interesting recipe, can’t wait to get home and try it out. Sounds delicious! Thanks for the post! this looks magnificent, thank you! two of my favorite things in life are Steven Brust novels and Turkish coffee. I used to order my Turkish coffee from Natasha’s cafe (natashascafe.com), but I’m finding that more and more coffee places will grind anything you want to a Turkish grind. I was able to buy my turkish coffee pot from a local Middle Eastern restaurant, and i think they are selling the coffee now too. Hmm, that looks delicious! Thanks for the recipe! Never really thought about it, but the egg shells are made of calcium carbonate, a base-so including them should theoretically cut down on the acidity. Wonder if seashells would work as well, since they’re also made of calcium carbonate. I have Been reading (and re reading) Steven Brust’s novels since Jhereg was in it’s first print; It has always amazed at how the author lavishes such detain into his descriptions of food. this is one that I had been longing to try for a long time. it is indeed as mellow and without the bitterness of an American, or in my case, Canadian coffee. Can one reuse the eggshells? And do I have to take the skin off? Can you reuse the eggshells? And does one need to get rid of the skin? I took it all off this time because I wasn’t sure. It seems like you could probably keep the egg shells, wood chips, and vanilla bean in mesh bag, and let them steep with the grounds in the french press, then remove them before pushing the filter down. This would allow you to reuse those elements. While I’m certain this would be a delicious cup of brew, it’s not really accurate to how Klava should be made. The recipe is expanded upon in at least one of the later books, and it would make a BIG difference in taste. In Tiassa, Vlad points out that the coffee should be a cold brewed one that is heated up just before it is pushed through the filter. I don’t know if you’ve ever tasted cold brewed iced coffee, but it is very different from iced coffee that’s been cooled down after it was brewed hot. Also, I’m the necromancer from the books come to revivify old comment threads.